A US Air Force (USAF) B-52 Stratofortress carried out US President Donald Trump’s edict to unleash the full might of US military force on the Taliban in Afghanistan when it set a record for most smart bombs dropped on the group in a single bombing campaign on Tuesday. US Forces Afghanistan reported that the B-52 deployed from Al-Udeid Air Base in Qatar to drop 24 precision guided "smart" bombs on a Taliban training and narcotics facility in Badakhshan Province. This campaign shatters the previous record set in November, when a B-52 dropped 19 smart bombs on a Taliban opioid production center in Helmand Province. "Over the past 96 hours, US forces conducted air operations to strike Taliban training facilities in Badakhshan province, preventing the planning and rehearsal of terrorist acts near the border with China and Tajikistan," US Forces Afghanistan wrote in a statement. Also as part of the bombing campaign, F-16 Fighting Falcons targeted Taliban vehicles that had reportedly been stolen from the Afghan National Army and were in the midst of being converted into bombs on wheels. Army Gen. John Nicholson, who leads US Forces Afghanistan, praised the new strategy that made this concentrated bombardment possible in a Tuesday statement to reporters. "The Taliban have nowhere to hide," he said. "There will be no safe haven for any terrorist group bent on bringing harm and destruction to this country." "The new strategy highlights that this is a new war. The gloves are off. We've got now [the authority] we need to be able to go and target the Taliban network… That is our new strategy going forward and it's definitely been a game-changer and the Taliban is definitely feeling it." The famous B-52 Stratofortress has been in continuous use by the USAF since 1955, making it the oldest vehicle still in service in the US military. Capable of carrying 35 tons of munitions, usually totaling around 100 bombs of various sizes, the B-52's destructive capabilities have made it an enduring piece of military hardware. During the US invasion of Afghanistan in 2001, 10 B-52s dropped a full third of the bomb tonnage unleashed against al-Qaeda and the Taliban. The bomber was re-deployed to Afghanistan in July 2016 as part of the Obama administration's policy to increase air power against insurgent groups. That same policy has been bolstered and expanded under Trump. The USAF reported that their B-52s dropped 1,500 bombs in Afghanistan in 2017, with about half of them being guided explosives. In the meanwhile, the F-22 Raptor stealth fighter conducted its first-ever mission against the Taliban in November. And in April, the US dropped their largest conventional explosive, the 21,600 pound GBU-43 Massive Ordnance Air Blast — better known as the "Mother of all Bombs" — on a Daesh cave complex. 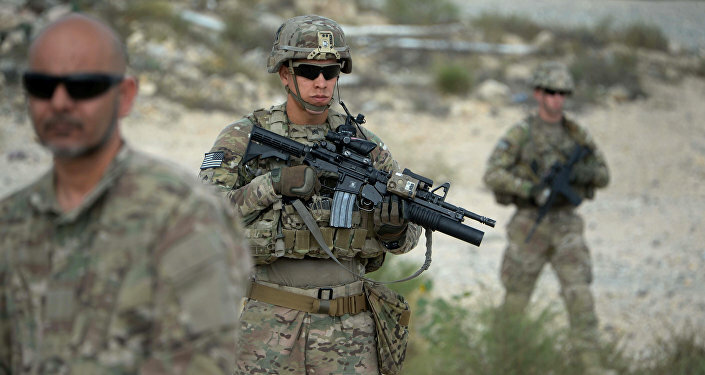 In addition to the intensified air campaign, the US has increased their troop commitment in Afghanistan, most recently announcing the transfer of an unknown number of US soldiers stationed in nearby Iraq now that fighting against Daesh there had wound down.